There are plenty of advantages to spending some time outdoors. It is good for both your mental and physical health. Sunlight helps you get your vitamin D, fresh air is great for your lungs, and nature is supposed to be a good way to manage to stress and mental health disorders. You also may simply be the time of the person who enjoys spending time outside of your home or you may be hosting some sort of event that you would prefer to have outside. Unfortunately, night time or winter time can bring in the cold weather, which means spending time outdoors may not be an option as often as you want it to be. No matter how good you are at ignoring and withstanding the colder weather, there is going to be a point at which you decide that you need to go back inside in order to avoid freezing. If you do not like it when colder weather chases you back indoors, then you should try to find a way to stay warm on your patio to maximize the amount of time that you can spend enjoying the outdoors. Blankets and hot drinks are obviously one simple solution, but you may also want to consider looking for a good patio heater to keep you feeling comfortable and toasty all year long on the patio. Patio heaters are definitely an extremely simple and effective way to keep warm on your patio when it gets cold outside and you want to enjoy the night’s sky. 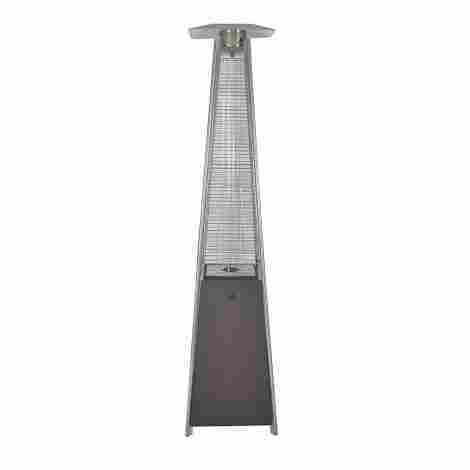 There are a wide variety of patio heaters that you can choose from. As long as you can figure out what your exact heating needs are, you should be able to find a good patio heater that works well for you. There are energy efficient options, powerful options, cheap options, luxury options, elegant options, small options, big options, long lasting options, easy to use options, and more. Additionally, they often work better than other forms of outdoor heating because they are easy to clean and easy to maintain. They are also relatively safe to use as long as you follow all of the instructions in the user safety manual. Of course, if reading manuals is not your thing, then there are options that come with plenty of safety features just in case. To further avoid reading instructions, plenty of patio heaters come already entirely assembled. Therefore, you have little to no excuse not to get a heater. If you are looking to extend the amount of time you spend outdoors sitting on or around your patio, then there is probably a patio that will work well for you. 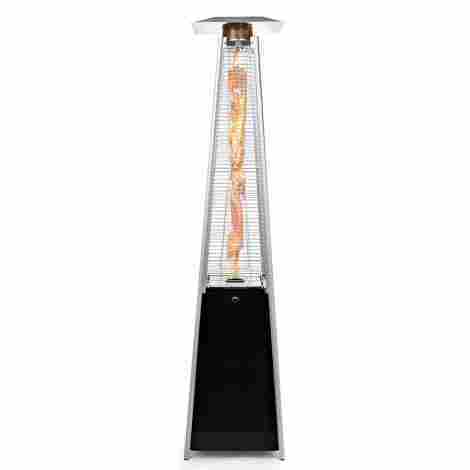 The AZ Patio Heater HLDS01-GTSS is a quartz glass tube patio heater that runs on propane gas. It will only obstruct 20 x 20 inches on your patio, but it does stand 91 inches tall. This patio heater comes with wheels attached to the bottom, which makes it easy to move around in order to find the perfect place on your patio for this heater. The anti-tilt safety device will ensure that this patio heater is never resting on a surface that is not flat because uneven surfaces can pose as a fire hazard. At around $200 for the black model, this patio heater may not be the cheapest option, but it is definitely within a reasonable range for a durable 40,000 BTU patio heater. 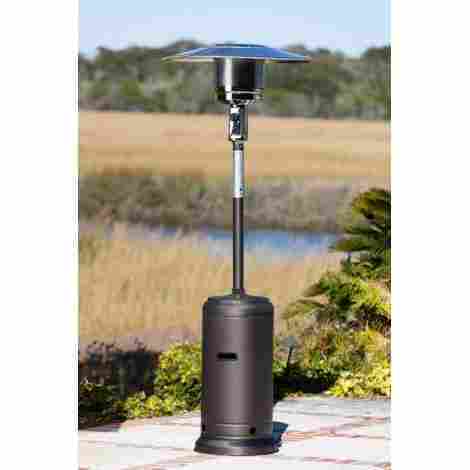 XtremepowerUS Premium Outdoor Patio heater runs on propane gas. 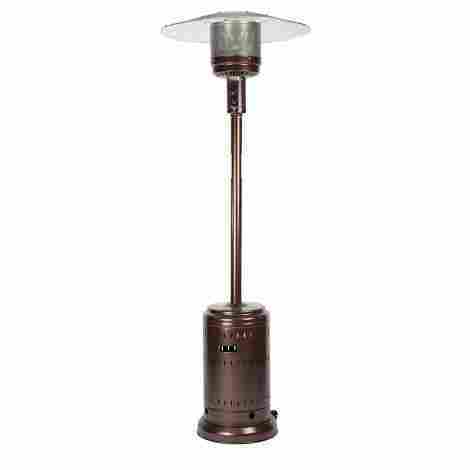 It is a free-standing eight feet tall and 35-pound patio heater that is good for outdoor events. This free-standing heater emits heat in all 360 degrees with over a six feet heat radius when temperatures are close to freezing, meaning it will cover well over twelve feet of ground in very cold temperatures. While other heaters have extremely sensitive safety features that shut the heater off sometimes, the only thing that can turn this heater off is you, which makes it good for special events. The XtremepowerUS Premium is definitely within a reasonable price range, especially for such a large heater has an impressive 48,000 BTU and a long heat radius. 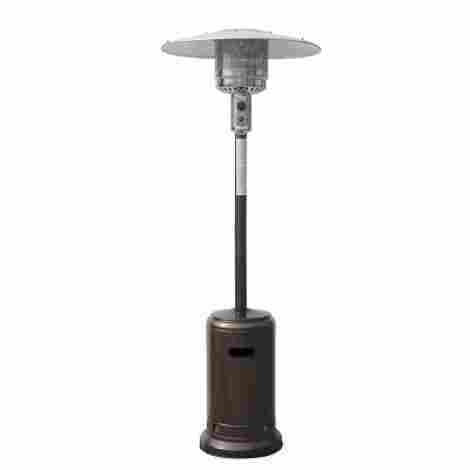 The Fire Sense Patio Heater is a free-standing patio heater with 46,000 BTU that is powered by propane gas. It is 89 inches tall, and it is made from stainless steel. With this important Tip-Over Protection safety feature, you will not have to worry about this patio heater posing as a fire hazard if it ever starts to fall over. Stainless steel is definitely a heavy-duty material that will ensure that your patio heater is not prone to dents or breaking, so your patio heater should last a long time. This heater comes in many different colors. Each color varieties have different prices, but they are all around the same price point, still a reasonable cost for a stainless steel 46,000 BTU patio heater. This product from Palm Springs is a CSA-approved heater that features a large 32-inch hood which helps to disperse your propane heat evenly. This option is equipped with an automatic shut off feature. This is especially handy if you're hosting an outdoor party and forget to turn off your heater before you head inside for the night. This ain't your Ikea patio heater. This Palm Springs product comes with simple, easy-to-understand instructions that makes assembly an absolute breeze. This isn't the cheapest option available on our top ten list, but it is not close to the most expensive, either. You can expect to pay a middle of the road price for this option, but it's automatic shut off and snazzy appearance make it an attractive option. This 89-inch tall patio heater punches an impressive 46,000 BTU in pretty cold conditions. It is reasonably sturdy, and it is another heater that is great from special events. Because this heater has no pilot light, it is not going to waste any fuel. You also will not have to worry about the wind extinguishing any flames or blowing heat in the wrong direction. You can fill the base up with sand so that it will not blow over in the wind. This safety feature makes it unique to another similarly designed patio heater, which only has room for propane in the sand. The Golden Flame Patio Heater is definitely on the expensive side. The high price probably has to do with that its design is much safer than similar models. The AmazonBasics is another stainless-steel design with a heat output of 46,000 BTU. It stands at 89 inches tall, and you have the option to purchase it with a cover. This patio heater will automatically shut off if it senses that it might fall over. This safety feature is important for reducing the risk of fire. With a commercial grade stainless steel construction, this patio heater is not going to dent or break easily, so you can assume that this heater will last you a long time. 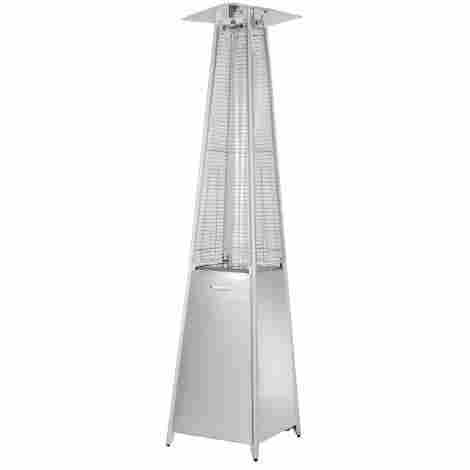 This patio heater is at an incredibly reasonable price point for a stainless steel 46,000 BTU design that is almost 90 feet tall. The cover actually costs more than the product itself. Ener-G+ Outdoor Patio Heater is a free-standing electricity powered patio heater. At only 34 x 28 x 24 inches of height, this heater will fit on your cramped patio. This safety feature is one that most other patio heaters do not necessarily have. Without emitting any carbon monoxide, this patio heater will keep both you and the environment safe and healthy. With anything electronic, you sometimes have to worry about water, but this electrical patio heater is water resistant. Therefore, it is both safe and easy to clean. This price for this product is not particularly low, but it is still incredibly reasonable. The heater will last you a long time and will be well worth the money. 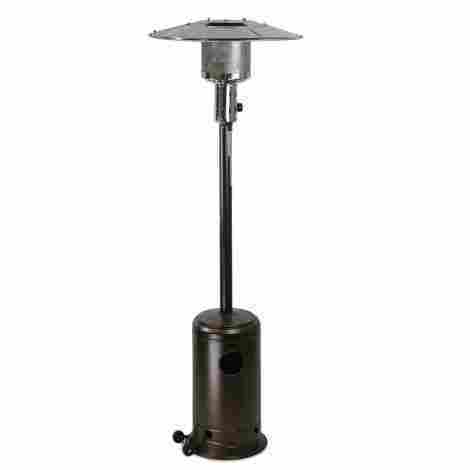 Thermo Tiki Outdoor Patio Heater is powered by propane. It reaches between 42,000 and 45,000 BTU, depending on the temperature, the wind, and a few other weather factors. There is some steel this heater, but there is also aluminum, which gives it a certain stylish quality that bulky steel cannot. It also reduces your risk of burns. The dancing flames inside the aluminum cage column that makes up most the heater appear when you turn the heater on. These dancing flames allow this outdoor patio heater to be incredibly attractive. This is not cheap for a patio heater that has a heat output of only 45,000 BTU at its best. 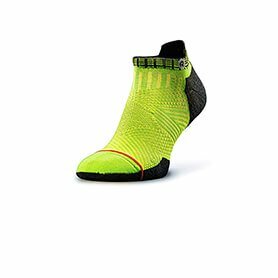 However, it is weather resistant, safety certified, incredibly efficient, and super stylish, which means it may be worth your money. Versonel VSLWMH100 is a wall mounted patio heater that can also work indoors. It is small and will save you plenty of space if you do not have enough room on your deck for a free-standing heater. The real benefit of wall mounted patio heaters is that they save a lot of space. It also means that it is small and easy to bring inside for indoor use. Compared to other electrical heaters, this one will save you over 30% of electricity. The reason it is so efficient is that it has a lifespan that will last you over 10,000 hours. This product is reasonably priced and is compared in cost to many of the other options on our list. It will last you a long time and, because it works indoors, it can serve multiple purposes. Legacy Heating Patio Flame Heater uses a quartz glass tube with a flame to heat you up at 40,000 BTU. It is powered by propane and burns for a long time. The anti-tilt safety device will ensure that this patio heater never runs when it senses the patio is tilted due to resting on a flat surface. Safety feature protects you against fires. The stainless-steel finish looks classy, and it will ensure that this heater does not break easily. It will last you a long time and withstand many different weather conditions. This product is definitely not cheap, but you can get the same thing for cheaper if you are willing to sacrifice the stainless-steel finish. However, the stainless-steel finish will definitely mean that it will last a long time. Normally, the outdoor season only lasts the summertime, which might be a bit upsetting to you. Perhaps you find the outdoors relaxing or maybe you just want to get out of your loud and busy house every now and then. If you are the type of person who wants to extend the outdoor season, then you either need to find a way to become resistant to the cold or you better find some way of staying warm. Finding a way to stay warm outside when the cold air blows in is definitely pretty simple. You will no longer need all those extra blankets and cups of steaming hot beverages. All you need to do is figure out how big your patio is and then find a heater that will adequately suit your size requirements. There are many different designs and models that each have their own advantages. Whether you care most about BTU, size, look, or durability, there is going to a patio heater that will work well for you. With so many different types and designs of patio heaters to choose from, you might be wondering which patio heater is going to suit your needs the best. Do you need a propane heater, electric heater, or a natural gas heater? Do you need a wall mounted heater, a free-standing heater, or a tabletop heater? Do you need to worry about power, energy efficiency, or safety? All these questions and more might be a little bit difficult for you to answer. 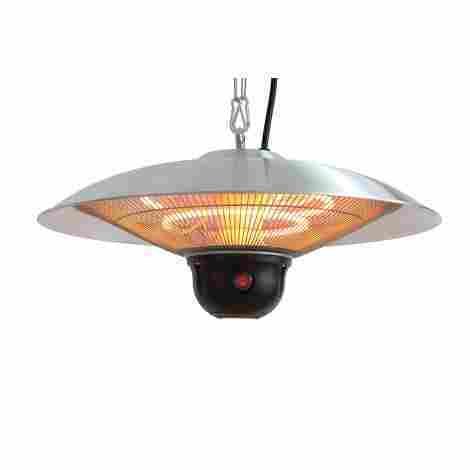 In order to properly evaluate all the different types of patio heaters available, your patio heater should reach a certain practical, safety, and aesthetic standard. To ensure that the heaters are not substandard, they must meet certain criteria. As long as they meet a wide range of the necessary criteria, your patio heaters should be able to suit all your outdoor heating needs. Since your patio heater is, after all, a heater, you need to make sure that it can keep you warm. In order to figure out whether your patio heater is going to provide you all the heat that you need, you need to consider watts and BTU. The balance between saving energy and ensuring that your heater is strong enough is going to be a difficult one. However, the best heaters are going to be energy efficient, powerful, and small enough to fit on the average patio. The amount of BTU you need will depend on a number of factors. First, you need to calculate the area of your patio. If you do not need to heat up your entire patio, then you are going to need to be able to figure out the area of the region that you want your patio heater to heat up. Add a couple of square feet to the area that you calculated because the label on some of the patio heaters might choose to exaggerate the actual BTU or it might choose not to take certain external factors into consideration. The second thing you need to figure out in order to determine your required BTU is how much warmer than the outdoor temperature you need your patio to be. You should also overestimate this number a tiny bit just in case you end up outside when it is a little bit colder than you initially expected. By multiplying together, the desired temperature increases and the area of your patio, you will get the number of BTUs that you need to ensure that your patio heater will be strong enough for you. You also need to figure out how many watts you need. All you have to do is calculate the radius of the circle of heat you home your heater will cover. Multiply this radius by 100, and the result should be the minimum number of watts you need to ensure you are heating everything up. You may feel free to overestimate the watts as well just in case. The best patio heaters are going to be a size and shape that will fit on the average patio. However, when it comes to determining the perfect size for a patio heater, the size of your patio is not the only factor that you need to take into consideration. If you have a table, some chairs, or anything else already sitting on your patio heater, then there is a chance that you need a smaller heater. Unfortunately, the smaller heater might not be as powerful, but you may only need to heat the area with the table and chairs. After all, this is the area where people will most likely be sitting around. If your table is big enough, you may even be able to put a patio heater on top of it in order to get just the right radius of heat to cover everyone who may be sitting at the table. If you truly do not have enough space for the heater, then wall mounted heaters can save you some space. The downside of these heaters is that they do not cover a circle of space. 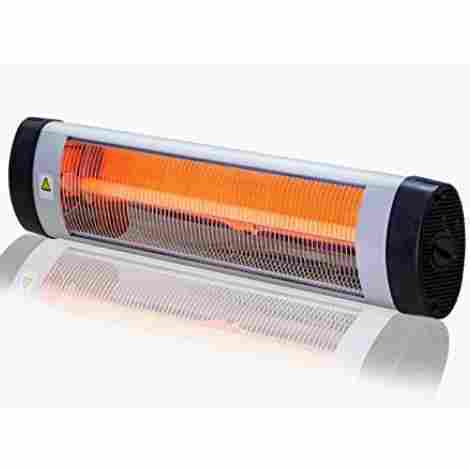 You would need to be sitting or standing almost directly underneath it in order to reap all the benefits that this type of heater has to offer. However, it definitely does have an advantage if you have a smaller or more crowded patio. Since they do not take up any space, you can even buy more than one in order to increase the amount of space that they cover. Without a doubt, you do not want your patio heater to break. It should be sturdy so that it does not fall over that easily. It should be made from materials that last a long time. It should be able to withstand a certain amount of bad weather. In fact, the best heaters will not break in a storm. Other heaters, while definitely reasonably strong, are best taken inside during a more serious storm, which is probably not the biggest hassle in the world, especially considering you are unlikely to be using your patio if there is a storm raging. Additionally, heaters should be able to withstand hot temperatures for a long time. If they are conducting heat, then they cannot be made from materials that wear down under extremely high temperatures. Otherwise, they are going to break easily. You definitely want to be able to get your use of your patio heaters, so make sure that you will not have to replace them all that quickly. Eventually, they may need a replacement, but you ideally want them to last for several years or more before they stop working properly. Heaters can provide both a fire hazard and a burn hazard. Therefore, you want a heater that is a safe as it possibly can be. Since heaters are safer on flatter surfaces, you want a sturdy heater that is not easily dented or tilted. Some heaters will also come with safety features in order to ensure that they shut off if they sense some sort of danger. Burning is definitely more difficult to avoid. If heaters did not get hot, then neither would anyone trying to benefit from the heater. However, there are still plenty of safety features out there that can prevent burning. Some have cages and similar types of coverings around the flames. These coverings do not get hot, but they still allow heat to reach you because they have holes. Another common safety feature is to have handles or stands that can be safely touched without burning yourself as long as you stay away from the part of the heater that is hot. The best heaters will give you a certain amount of control over heat and intensity. Electrical controls are definitely easy to use. It is also an advantage if you have a way of adjusting the flames. You can find any heater for any budget, but you also want to make sure that your heater works well enough for you. With all the best heaters, you are going to get exactly what you paid for. While you should definitely have a realistic budget, you should not expect to pay an insane price for a patio heater that is not also insanely good. Fuel is another cost that you definitely have to think about when purchasing a heater. Natural gas and electric heaters will use gas or electricity from your own home, which is definitely the easiest options and you will only have to pay for what you use. However, some patio heaters use propane tanks, and you will have to purchase that yourself. If you are not willing to spend time or money buying propane tanks, then you will want to consider a heater that uses gas or electricity from your home. An outdoor heater always has a chance of getting a little bit dirty, and you might care about cleaning it. However, every now and then, you may feel that you want it to look a little bit cleaner and the best heaters should not be too difficult to clean. You also do not want your cleaning supplies to damage the heaters. While certain abrasive chemicals will damage even the best heaters, you should be able to use gentler cleaning supplies without running into any problems. Many heaters work just fine once you figure how the best way to set it up. However, you do not want it to be impossible to assemble your heater. It is definitely a bit of an advantage if your heater comes fully assembled. If you have a certain aesthetic going on around your patio, then you do not want a heater that ruins that aesthetic. Some heaters have an elegant design, and some heaters are easy to camouflage against your house. Appearance obviously is not going to affect how well a heater works, but you should have the option to purchase an extremely effective heater that does not look too bulky or too awkward. Q: How can you ensure that your patio heater is safe? A: The most important thing you can do is read the instruction manual because every heater is a little bit different and comes with slightly different hazards. However, there are also general guidelines to follow that works with all heaters. For example, do not install a heater on a surface that is not completely flat and make sure you know how to store your heater and any spare fuel. Q: What makes heaters better than outdoor fire pits? A: Fire Pits and fireplaces are much messier than heaters. They require a lot of cleaning, while heaters only rarely have to be cleaned. Heaters are also a little bit safer, while fire pits can ruin the air quality and even start a fire if you are not extremely careful. Q: Can the heaters be moved around? A: Some certainly are portable, but some are not. For heaters that are not portable, you do not want to underestimate your watts and BTUs because you will not be able to move it around in order to ensure that it is heating the proper region. Q: Will you ever have to purchase a second patio heater? A: Whether or not you will have to purchase a second heater depend on a lot of different factors. First of all, eventually, heaters do wear down, and you might have to replace an old one. However, many of the best heaters can last for an incredibly long time. Second of all, if the heater you choose does not adequately cover the appropriate amount of ground, then you may want to consider purchasing a second one to fill in all the missed space. In some cases, if your patio is particularly large, it may actually be cheaper to purchase to heaters instead of purchasing one. You will have to do the math in order to figure out what works best for you. Q: Can patio heaters be used indoors? A: Unless otherwise specified, outdoor heaters are not designed for indoor use. They are for your patio and taking them indoors can actually pose as a serious fire hazard. As portable as your heater may be, it should never be used indoors? Q: What is the best way to store the propane tanks? A: Propane tanks should be in a relatively cool and ventilated location and, when it is not in use, make sure that the valve is completely closed. If the cylinder starts to wear down, you should try to replace it. There are a few signs to look out for in order to figure out if your propane tank is wearing down. Replace it if it rusty, dented, or peeling. Additionally, never store propane tanks inside your home just in case something goes wrong, after all, the explosive force of pressurized propane can lift your house partially or even completely off of its foundations. Your basement and your garage count as your home, so do not store propane tanks there either. If you sense danger, do not use any sort of electricity until you are far away from the area. Once you have cleared the area, you can use a phone to call emergency services.